There are bulbs under all that snow! The snow is actually melting, though it’s not gone. I see the southern side of my garage would be a good place to grow something if I weren’t worried about potential lead paint. Maybe sunflowers. You’ll also notice my complete indifference to raking leaves off the mulch last fall. 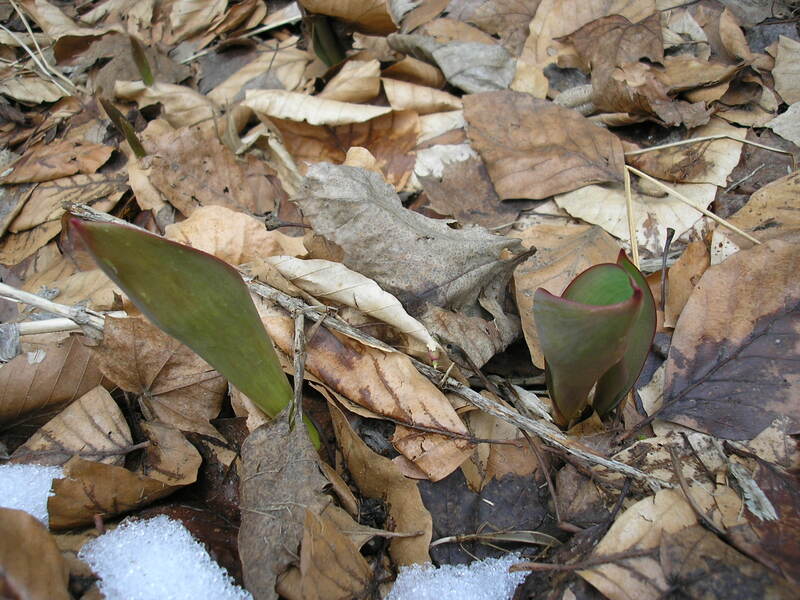 I don’t know what plants these are…tulips? I know there are no crocuses in the bed, only in the yard itself. Time will tell. It will also tell whether my San Marzano seeds are duds. Everything else has sprouted, even the Principe Borghese which I had doubts about, plus the tomatillo. I’ll be planting seeds tomorrow or Tuesday; today turned out not to be a good day. It’s suddenly occurred to me that maybe the Buran peppers were the only ones to sprout because they were the only ones I replanted. If I get no activity from the others tonight or tomorrow, I’ll replant. It also occurred to me that it’s been a while since I did a Growing Challenge updated. Unfortunately there’s not a lot to update. The broccoli and cauliflower sprouts are growing; one Sorrento seedling in particular is the frontrunner of all the seeds and makes me quite happy (and very tempted to try just a little of a leaf to see how it tastes, but it’s not big enough yet); the rest of what I plan to grow hasn’t been planted yet. Because there’s still snow on the ground. I have made more flags for this weekend’s planting (the April 1 one, but I think I’ll do it a little early because weekends are convenient and my other plans for Sunday include ‘sleeping late,’ ‘making cookies,’ and ‘sleeping later’): three kinds of basil, more Utah celery, wormwood, elecampane (hooray for dyeing herbs! ), nigella sativa (hooray for herbs I’d never heard of before!). Hmm, I have just noticed that Colleen is also in a mini-update mood. That also reminds me that I have to go vote for the Mouse & Trowel awards. I have a feeling that will require more time trawling through garden blogs than I really ought to devote at work, though, so perhaps I’ll put that on the list with the cookies. The ground between my house and my garden is finally bare of snow. So I walked that way, bringing the full compost container along with me. Things are messy in the garden. 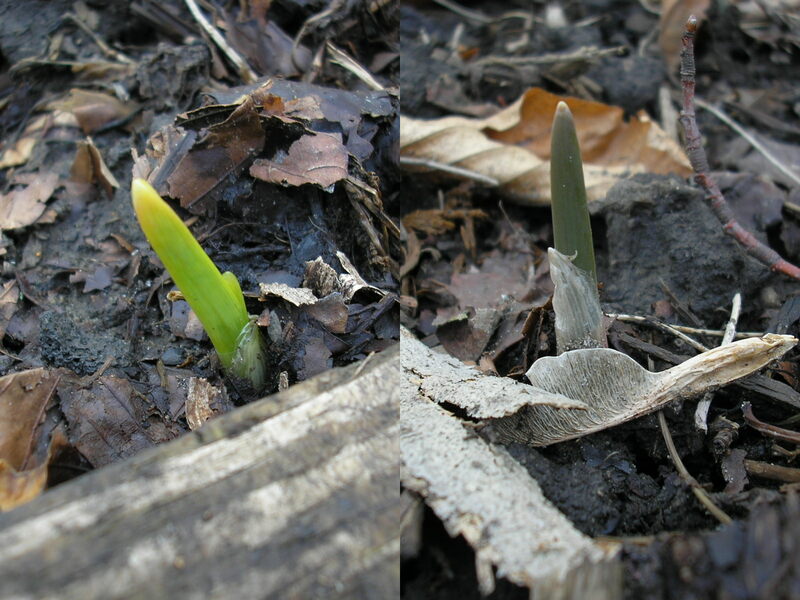 I walked back along the garlic bed…and saw green spikes. I have never grown garlic before (except inadvertently, in the tub under the cookbooks with the onions). But it’s alive! I planted two varieties, Georgian Crystal and Lorz Italian, and I, um, think I planted them in alphabetical order, so the Georgian Crystal would be the bright green ones on the left. One’s hardneck and one’s softneck, so I’ll know for sure later in the season. I didn’t even see the much muddier-colored ones at first. I’m charmed that they’re so different, so early. When I went inside, I found more green sprouts awaiting me: nine types of tomatoes, and–finally–three out of four Buran peppers! The tomatoes that sprouted were Roma, Cosmonaut Volkov, Tiger-Like, Italian Market Wonder, Zapotec, Black from Tula, Costoluto Genovese, and Persimmon. I expect more tomorrow. I also expect to have to bring some tiny scissors to the window and weed out some feverfew so that the rest can live. That’s fine. We went out to get pea stakes and twine today, and if I can’t use them this weekend for the snow showers we’re threatened with Friday, that’s fine too. I have life. My guess is that it’s colder this year than it was last year (yesterday’s prediction has become snow/rain) and that’s why I’m not getting any germination from the peppers. The weather channel does predict highs in the 40s and lows in the 30s, which is promising, though we’re definitely below average for March. Assuming we don’t get ridiculous deluges today, Eric and I are going to Home Depot tomorrow for dirt and stakes (“Tomatoes are carnivores?” he said, and I hit him) and twine. Perhaps it’s overly optimistic to think we can work on the yard this weekend, but optimism buoys me. One of the things we need to do with the dirt is fill in the sides of the driveway, where there have been little ravines all winter long (but not as deep as they were in the fall, I think). Then we will have to face a hard question: do we tear up a bit more lawn and plant shrubs and put down mulch, thereby relieving Eric of even more lawn-mowing duty, or do we put down grass seed so that the neighborhood kids can continue to run unimpeded across our yard from the neighbor-on-the-left’s house to the neighbor-on-the-right’s house all summer? It’s a tough call. The snow is melting, the sun is shining, the cauliflower is up, and I once again believe that spring will come (the real spring, not just the calendar spring), resurrected once more. 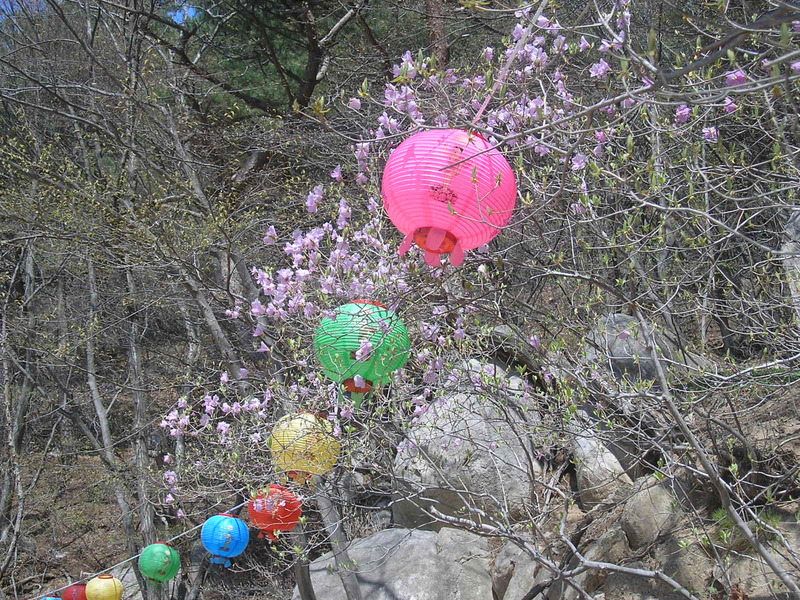 When we were in Korea we visited a Buddha temple, and it was getting near the anniversary of the Buddha’s birth, so lanterns were strung everywhere. I saw a truck with “Liquid Deicer” on its back trundling down the freeway on my way to work. They’re predicting three to six inches of snow between today and tomorrow. I’m depressed. “I think it’s interesting that you took up gardening,” Eric told me sleepily as we settled into bed last night. “It’s another aspect of your…” He yawned. “Creativity.” Then he wanted to know whether it would be better to make salsa and can it, or just can the tomatoes and make salsa from the tomatoes when we want it, so we discussed that as I wriggled my toes in delight that he’s thinking about these things. But I thought his first comment was interesting, since gardening isn’t something I really thought of as creative. Like counted cross-stitch: you do the work but the pattern was there all along. I have a lot of hobbies, and I could theoretically be called creative for all of them (except WoW), but I at least wouldn’t. Which is funny; I started out in cross-stitch, but rapidly grew bored with it precisely because it’s not creative. Knitting is like that too, at least to the level I do it: pick a yarn, pick a pattern, maybe change a cable or alter a hem, but essentially follow a prescribed set of steps because I don’t know enough to do more. I like producing something useful–like vegetables–but the process is more serene than interesting. Quilting, on the other hand, I do creatively. I’ve never made a quilt from anybody else’s pattern. That, I think, would be like cross-stitch, except that again the end product is useful (if you don’t give it to somebody who considers it “too good to use,” that is). But my favorite part is designing the pattern. Do I want pictures or abstract designs? Do I want blocky geometry or smooth lines? How will the quilting add to the end effect? I consider myself a much better quilter than knitter (even though my execution is arguably less good) because I think about quilting on this higher level and am much more adaptable when things go wrong. Similarly, I spent half an hour last night tweaking my recipe for Eric’s rye bread. (Incidentally, this involved solving four equations for four variables. Never tell me math isn’t useful.) He loves rye bread for his daily sandwiches, but he’s never had the perfect rye bread, so I decided to make him some. I’m on my fourth iteration. I’ve done enough bread-baking and read enough of the theory (yes, there’s theory) to grasp what to do when he says “it needs to be softer” or “it’s too chewy.” I’d classify my bread-baking skills with my quilting skills, mainly because of that adaptability and capacity for independent design. I don’t have it nearly as much for other crafts. My gardening skills are, I think, somewhere between those two states–following instructions and being able to improvise. I’m still consulting books and the Internet and the backs of seed packets, but I’m slowly internalizing a bunch of information on what to plant when and why. I wouldn’t necessarily know what to do if I found, say, leaf curl on a random plant, but I do know why good soil is important. I’m learning what vegetables belong to what families, how they reproduce, what fruits when, why certain kinds of plants need certain care. I’m hardly an expert, but I think I’ll eventually get there. But I’m not sure I see gardening as creative. Or at least not vegetable gardening. Flower gardening, I could see: the putting together of different colors, shapes, sizes, scents in all the different months of the year. There’s some of that in vegetable gardening, too–succession planting, companion planting, interplanting for either aesthetics or functionality. But I’m not really making anything in my garden other than the structure I call a garden; those higher-level skills are, perhaps, the seeds of mastery, rather than creativity. I see gardening as functional, meditative, perhaps crafty–but not creative. I sow the seeds, pull the weeds, pick off the bugs; but the pattern was there all along.